gratitude and count our blessings, may all of us consider those less fortunate, including our many military veterans in need. 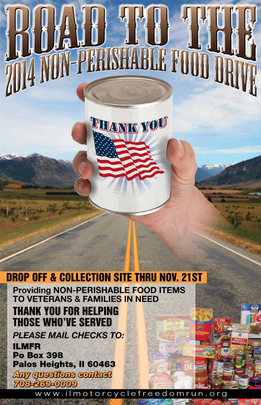 ...and get connected to 6th Annual Veterans Food Drive sponsored by the 2014 Illinois Motorcycle Freedom Run. This is an outstanding annual effort that provides turkey dinners with all the trimmings to Chicago-area veterans (including a number right here on the Southwest Side), as well as bags of groceries to help carry them through Christmas. This year's effort is even more ambitious, as it should be. It is dedicated to the memory of the late Army Pvt. 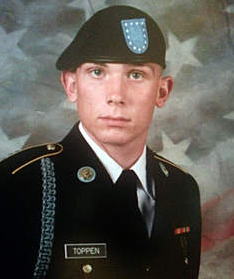 Aaron S. Toppen of Mokena, who lost his life at age 19 while on active duty in Afghanistan last June. Will you please help? You can donate money to buy turkeys and/or you can show up as a volunteer at the Bridgeview Sports Dome on Friday, Nov. 21 and help in person. Details are all on the ilmfr.org website. Thanks to our friend, Garfield Ridge resident Chuck Dryden, for reminding us about this worthwhile effort and encouraging us to join him in promoting it. Will you please help? Thank you, and may your Thanksgiving be filled with blessings.